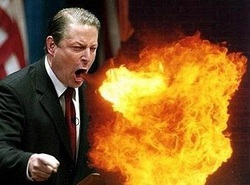 AL GORE - Coming Into Himself! I find Al Gore fascinating in that most of what he says has been said first by someone else's words - things he does has been done by someone else, and he is a hypocrite - he talks about saving energy when he has 6 homes with the last one over 6500 sq ft, his airplanes, hummers - he needs to put his foot in his mouth and keep it there. No one here wants to see the end of the world - nor do I want to see the end of America in the process of supporting the world (we really already do that) on a lie and hoax! I find he has always followed someone else's lead and never paved a path for himself until he and some other misinformed individuals decided we were in "global warming." Al Gore and Prince Charles have been friends for over 20 years. Both with a combined idea on how to manufacture a second plan for their lives if the first one did not pan out. It does paint a pretty picture of the two of them sitting in a garden terrace somewhere, sipping tea, sharing their concerns about the degradation of Mother Earth to "bring the world to their way of thinking" even if they were wrong. I don't believe they ever thought they would be "caught!" It is all about money and control after all. A little history - Both being born in the same year (1948) may not sound that important unless you remember they both semi-believe in the "para-normal." They may have even begun to gray and go bald in amazingly similar ways. I wonder, though, if the two men realize how their life stories match up. Each of them has been in a sense cheated out of the high position for which he was destined. Charles, next in line to the throne, may never become king. Gore, who as the son of a senator was a young prince of Tennessee even before he was elected to Congress, will probably never become president. As vice president, he was in a sense the American Prince of Wales—next in line. I want to state early on that it was only after a great deal of research that I found the connection of these two. The connection that inspired me to dig deeper was that in April 1991, fourteen months before UNCED, the Prince held a private two day international conference aboard the royal yacht Britannia, moored off the coast of Brazil. His goal was to bring together key international figures in an attempt to achieve a degree of harmony between the various countries that would happen at the Rio Earth Summit. Then Senator Al Gore was present, along with senior officials from the World Bank, chief executives from companies such as Shell and British Petroleum, the key NGO's, and other officials. For each man, the path was blocked by an older woman with stiff hair. For Charles, it has been, and probably will continue to be, his tenacious mother, who's not budging from the throne any time soon. For Gore, it was Supreme Court Justice Sandra Day O'Connor, who cast a fateful vote in Bush v. Gore. Each man has taken as his life's work, his life's justification, and perhaps for his consolation, the restoration of Mother Earth. 3. The both have made global warming speeches that sound almost identical. Gore states he first began working on "global warming" in 1976 but then states it was when his son was hit by the care in1989 that he claims that "changed everything" and began looking at the world. Prince Charles has never given any particular event that stirred his attention to global warming - he just thought it needed "tending to." Since leaving public office, Vice President Gore has shed much of his former wooden self-consciousness. Poor Prince Charles, born rather than elected to public life, can never escape. The problem with either man's earnestness is that it becomes smothering instead of inspiring. You feel you have to sign up for something near religious and painfully solemn. Let the birds eat the bugs. Let the insects fight it out with each other. Use compost to enrich the soil. Prince Charles Says Global Warming Will Not Kill You As Soon As Al Gore Says! The world’s two leading global warming hypocrites have squared off about how much time is left before we’re all burned to a crisp by global warming. But wait. Three-and-a-half years ago, Al Gore said we only had ten years left. The Al Gore’s Doomsday Clock on Rush Limbaugh’s website shows that we will all die in just a hair over 80 months. So which is it, you two scientific geniuses? Do we have a full eight years or just six-and-a-half? This is what happens when you lie and do not consult with your fellow lier's before you open your mouth!